The cap shroud chainplates on a Sadler 34 can be a source of persistent water leaks that are often blamed on the window. In our case water was gathering in the hanging locker, where it remains long-term because there is no drain hole. The job is straightforward but there are a couple of Sadler oddities. The plate is retained by a total of ten bolts, 17 mm spanner, five of which have nuts on them, bolted through the plywood bulkhead. 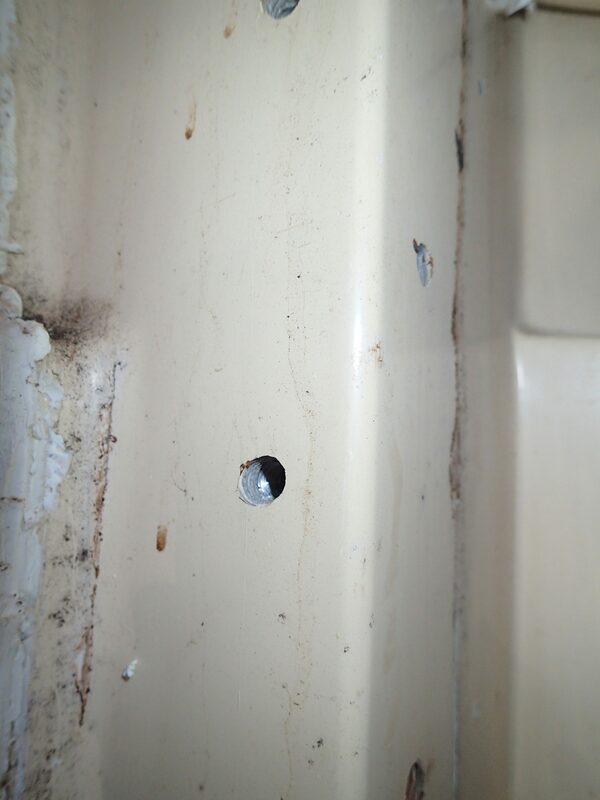 This photo shows the five bolt heads from the saloon side, with nuts in the hanging locker. Inside the hanging locker are the five nuts and the other five bolt heads. 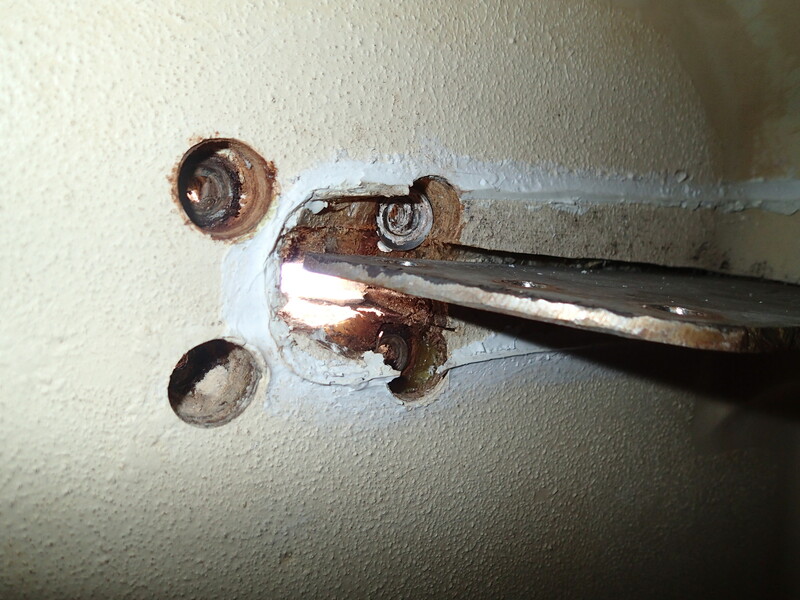 The bolts pass through the bulkhead from the hanging locker into the ring frame. It is not possible to see what is inside this but I suspect there are nuts in there, retained in some way by resin. One of mine is not there and the bolt is not fully tightened. 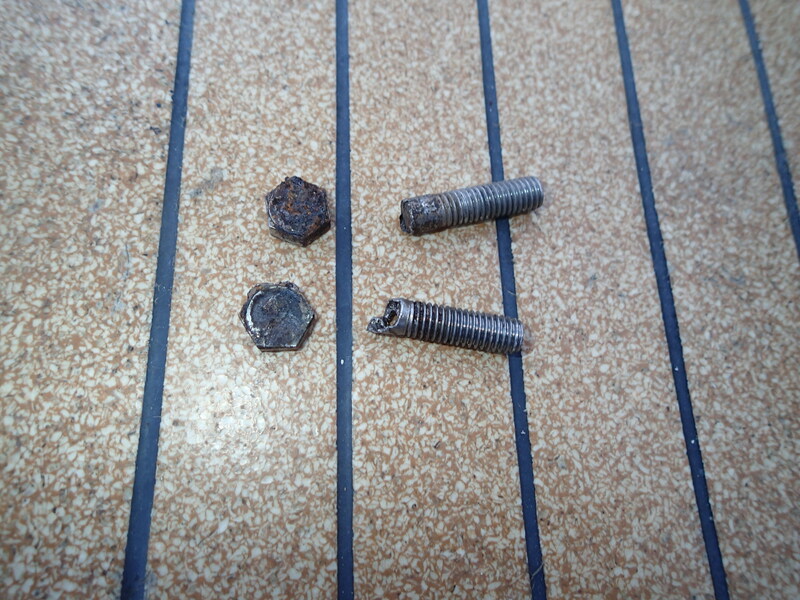 On deck there are four smaller bolts, 13 mm spanner, that screw vertically into the deck. The aft pair go into something positive, nuts or aluminium plate, but the forward two only screw into GRP. I attached the spinnaker halyard to the cradle beneath the boat and tightened it to its maximum. I then backed off the cap shroud bottle screw and removed the pin connecting it to the chainplate. Removal of the plate was perfectly straightforward, simply undoing all the bolts and pulling it out. 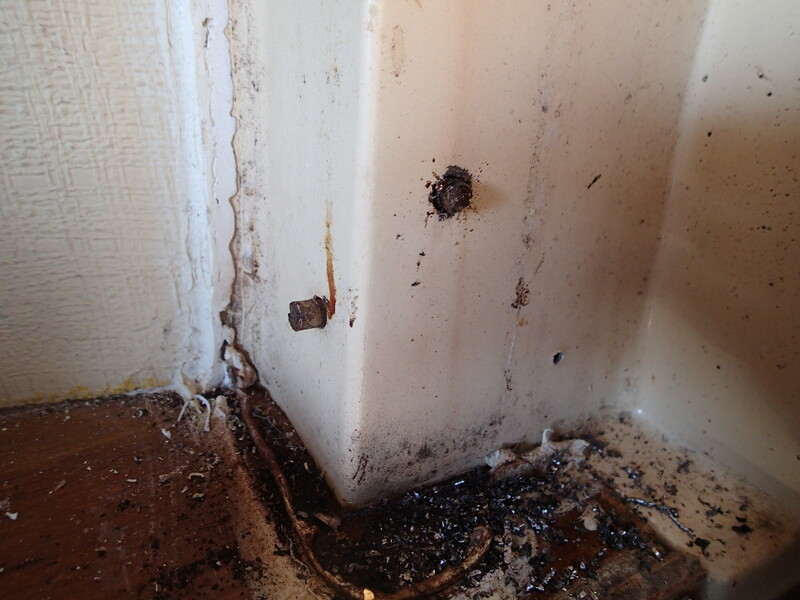 The reason for the water leak was immediately obvious, a complete breakdown of whatever sealant was originally applied. I rebedded the chainplate using PU40, very similar to Sikaflex 291 but half the price from Toolstation. Plenty applied to ensure full coverage. I tightened all the horizontal bolts before doing up the deck ones. I was loaned a Loos gauge which I used before and after the job. I was pleased to find that the figures for cap and lower shrouds were just right using the simple method described in this section of the website at http://coxeng.co.uk/sails-and-rig/setting-up-your-masthead-standing-rigging/. Cap shrouds are about 12% of breaking strain, lowers about 10%. 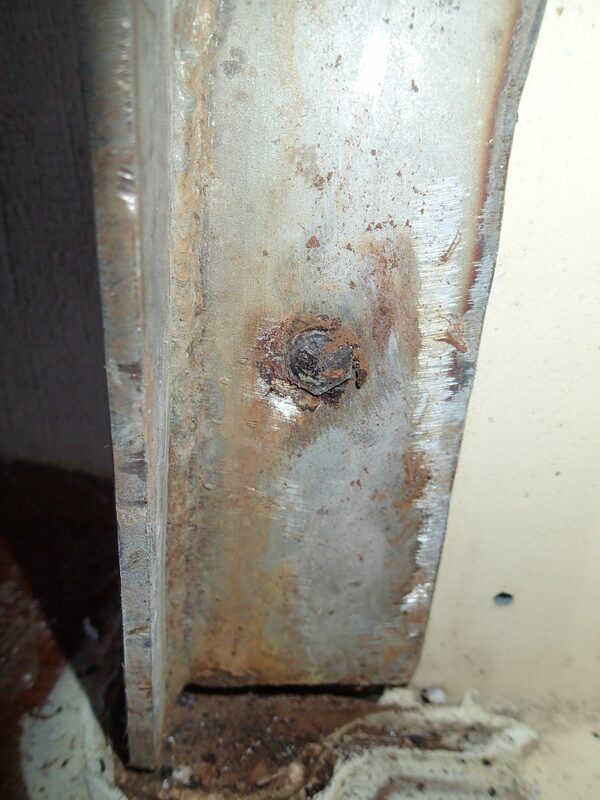 There was evidence of water penetration in the area over some period of time, with rust stains in the plastic plugs covering the bolts through the deck. The first task was to cut the sealant off the GRP cover over the chainplate assembly, easily done with a sharp knife. The two parts of the chainplate were then revealed, the right-angled section bolted to the hull including the knee and the chainplate passing through the deck. The lower shroud turnbuckle was slackened and its clevis pin removed. I did not think it necessary to support the mast any further. I began to release the four nuts and bolts holding the chainplate to the deck but soon realised that the three bolts holding the plate to the knee would need to be released to allow a socket to reach the fourth nut. 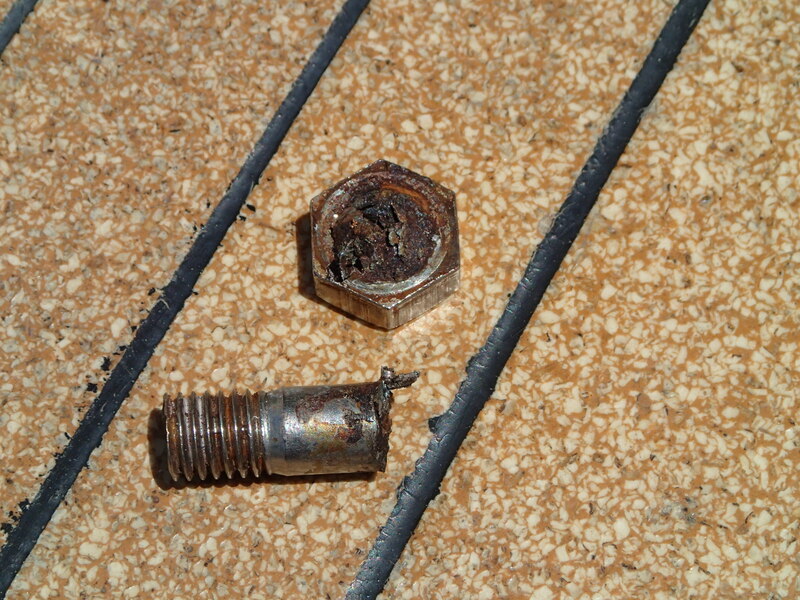 Removal of these three bolts allowed the fourth deck nut to be undone and the chainplate could be lifted on-deck. Very little sealant could be seen although I had re-bedded it many years ago. 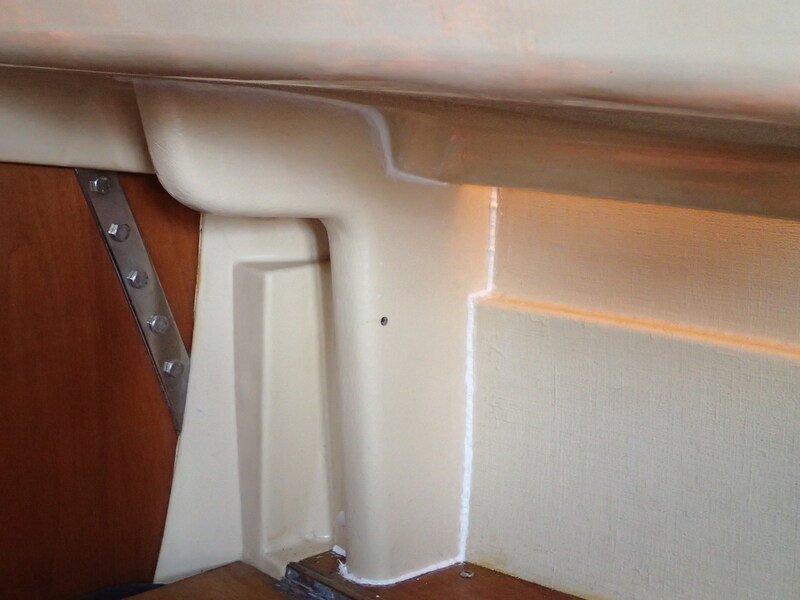 The bolts holding the right-angled section to the hull were checked and all found to require some tightening. All old sealant was cleaned off the deck and underdeck areas. This is important, as it appeared that silicone sealant had been used at some stage, inhibiting the cure of Sikaflex that I had applied previously. The result was a sticky mess. 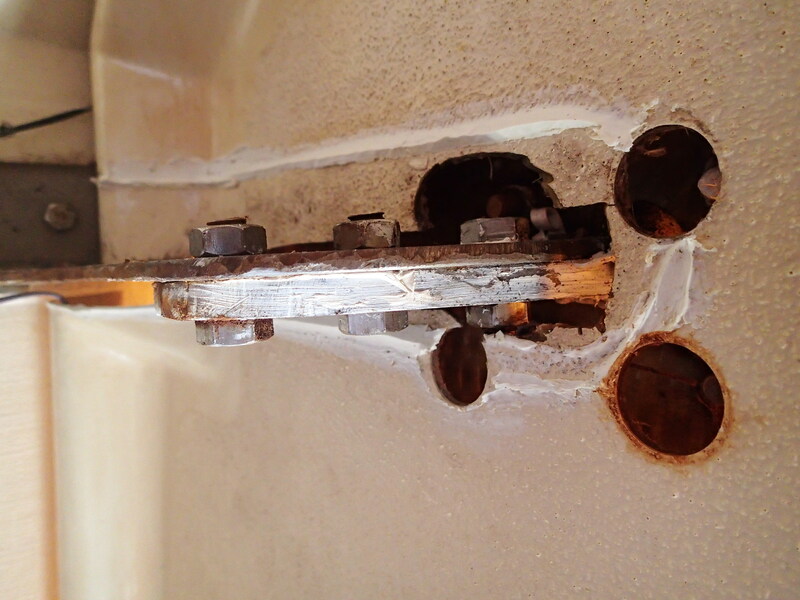 The bolts holding the chainplate to the deck were long enough that it could be dry-assembled and sealant pumped beneath it, making the job far cleaner. I used Puraflex 40, very similar to Sikaflex 291i and far cheaper. I used a generous amount to ensure no further water leakage. These bolts were tightened moderately, as the shroud loads are taken by the knee and excessive tightening extrudes all the sealant. I then inserted the three bolts connecting the chainplate to the knee. To my surprise one of them fractured due to stress corrosion cracking, even though these are below deck and theoretically never see seawater. I replaced the failed one after inspecting the other two carefully and tightened all three hard. It was then simply a matter of replacing the GRP cover and resealing with Puraflex, followed by re-connection and tensioning of the shroud. During this job it became apparent that the deck was commencing to bulge upwards slightly. The cause of this is that the lower chainplate knees are bending. Stronger versions of these plates are available from Mike Lucas. Having completed the starboard side I felt it necessary to check the port side. Removal of the cover was as for the starboard side but there was a construction difference in the deck, which on this side had some plywood between the skins. The three bolts holding the chainplate to the knee were loosened without problems, as were the four nuts and bolts holding the chainplate to the deck. 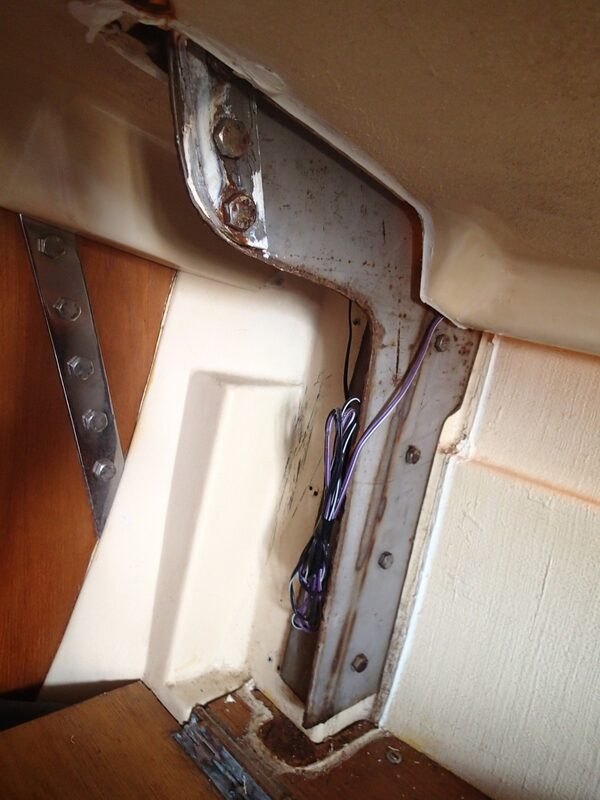 I began to tighten the bolts holding the right-angled section to the hull, which was where my problems began. 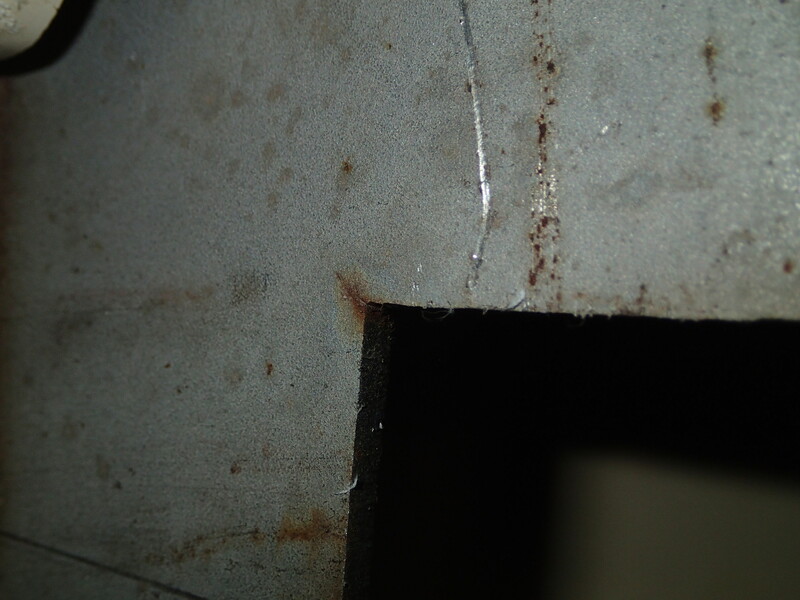 The heads of the lower two, one on each side of the angle, sheared off, again due to stress-corrosion. This meant that the plate could not be removed as the remaining shanks faced outwards at 90 degrees to each other. I managed to drill out one of them with some effort, releasing the plate and fortunately the shanks were easily unscrewed from the hull. 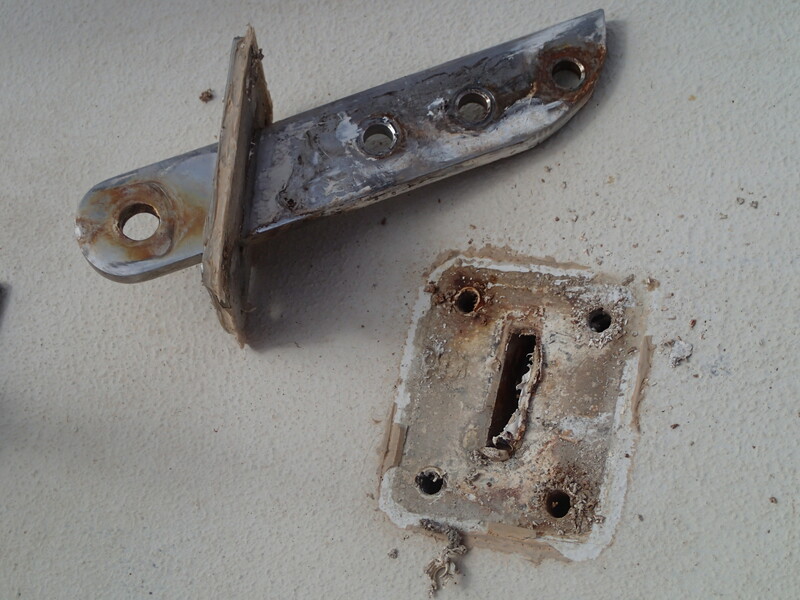 These bolts appear to screw into a piece of aluminium angle that is glassed into the hull at this point. There is a small crack at the inner corner of the knee that looks very much like a fatigue crack. This is a very typical location for such a crack, with a sharp right-angled corner without a radiused fillet. Ideally a small hole should be drilled at the crack tip to prevent further propagation but this will have to wait for a later date. Replacement of all parts was as for the starboard side, after checking all bolts carefully.